What is Sales Planning Tutorial? In Sales management process, one should be prepared with Sales Planning. This process of sales plan includes strategy, predicting the sales, demand management, setting targets for profits margins and the execution steps. It is a document with several resources involved in the plan with business targets. We are going to discuss on carrying out a successful Sales Planning. Targeted audiences are Salespersons who are interested in knowing the process of how to organize their activities in order to achieve business goals. 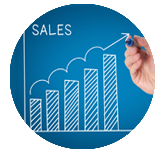 We will cover the overall areas that provide us a general idea on Sales Planning. Sales managers who are newly-appointed will benefit much from this tutorial by knowing the sales and its planning. Before diving into the tutorial, it is better to have basic idea on how Sales and Marketing teams function in a corporate environment.